I can't believe it's not Buddha. It's impossible to be in perfect harmony with all living things if you're worried about keeping a stick of butter fresh. 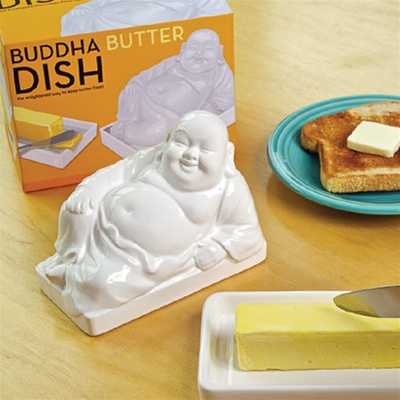 Hop on the delicious path to enlightenment with the ceramic Buddha Butter Dish. This tubby, ceramic butter shrine will bring luck to the table morning, noon and night while helping to grow a Buddha belly of your own. Clean regularly with gentle soap and water.